Click the Contacts tab that is located in the My Apps panel. By default, the contacts list for the user who is logged in will be selected and displayed. Click the drop down arrow next to the name displayed in the top right corner. 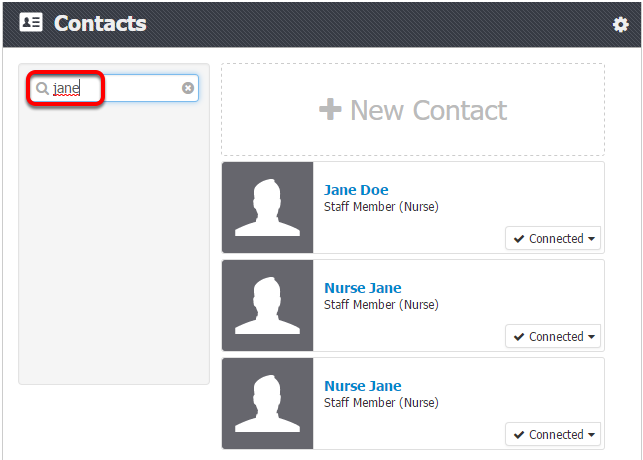 Locate the staff member in your contacts list and click on the staff members name to open the details screen. Click on the blue highlighted words after "with a role of." From the drop down menu, choose the correct role for this staff member (choose from Clinician, Nurse, Front Office or Administration). When needing to quickly find a person within your Connections tab, a user can start typing all or a few letters within the person's name, in the search box.